Artist’s concept of this research. Scientists have characterized the quantum behavior of buckminsterfullerene molecules, also known as buckyballs, with the hope of perhaps one day turning them into miniature quantum computers. Quantum mechanics deals in the physics of the smallest stuff—the tiniest in size, the shortest in time, and the lowest in energy—and posits that on the smallest scale, physical properties take on discrete values. Think about an atom absorbing a photon, causing an electron to jump up into a higher energy level. For this research, replace the atom with a buckyball, and replace the electrons with units of vibration and rotation. This team of physicists wanted to characterize buckyballs’ behavior in this low-energy quantum regime, and how their vibration and rotation changed in tiny jumps in reaction to bits of energy. The researchers first heated a solid mass of buckyballs in order to create a gas of the molecules, and then introduced them to a background cold argon gas that cooled the buckyballs to around -139 degrees Celsius, or-216 degrees Fahrenheit, so that they took on the lowest-energy state. 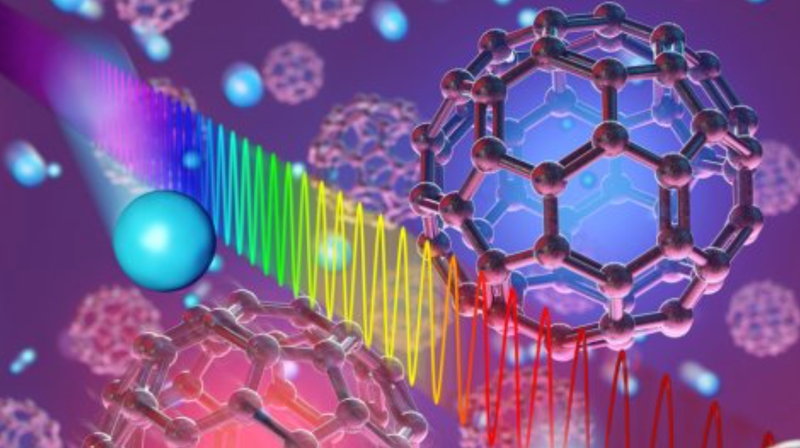 The researchers then shot the buckyballs with an infrared laser and measured how they absorbed the light in order to characterize the other quantum states. Typically, lower-energy rotations are more difficult to tell apart than the higher-energy vibrational states, but the scientists were able to measure the buckyballs with enough resolution to determine both the vibrational and rotational states. This is cool for a number of reasons. “The experiments reported here thus establish [buckminsterfullerene] as the largest molecule” whose individual quantum states have been characterized, according to the paper published earlier this month in Science. Normally, performing such a measurement would be impossibly complex, explained the paper’s authors, but it was made easier by the buckyball’s unique structure. And since we know that these molecules exist in space around carbon-rich stars, characterizing the molecule here on Earth could help scientists understand it in space. It’s mind-bending science, for sure, and we’re nowhere close to seeing a buckyball-powered quantum computer. But scientists are only beginning to unlock the true potential of these peculiar molecules—and the nature of quantum mechanics itself.